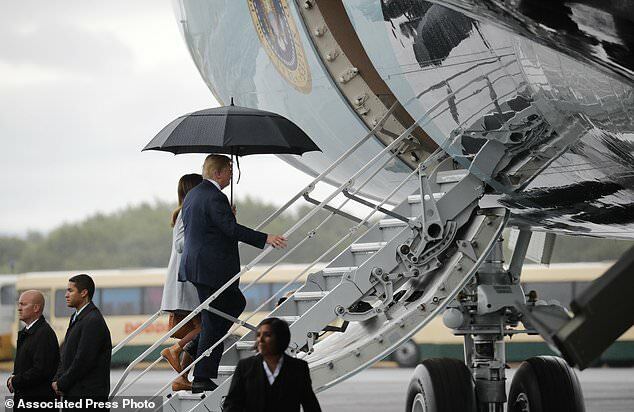 POTUS/FLOTUS boarded AF1 in the rain. FLOTUS, in a light blue or grey jacket, brown flats, brown pants, brown purse, ducked as she entered the plane. Pool was not in place to shout any questions. But Annie Karni caught John Bolton. She asked how Putin meeting prep went. He said “fine, thanks” before boarding. Bill Shine, Stephen Miller were among other aides boarding. Your pooler spotted a POTUS golf bag being loaded onto AF1: red white and blue with presidential seal and DONALD TRUMP in block letters. Gold tag attached reads DONALD TRUMP. AF1 was wheels up around 4:08 local time. …know how to do is resist and obstruct! This is why there is such hatred and dissension in our country – but at some point, it will heal! I saw a report about the dead woman, but didn’t know she worked for Soros.